Recognized as one of the most significant of American buildings, Trinity Church was designed originally by Henry Hobson Richardson, one of the first two architects to graduate from l’Ecole des Beaux Arts in Paris. Returning to America expecting to make his mark, he decided that there should be a uniquely American architectural style and developed what has become known as “Richardsonian Romanesque”. Trinity Church is its finest example. The building was dedicated in 1877. After the early death of its innovative architect in 1886, three of the architects who had been working with Richardson took control of the firm and finished his projects. Attributed to Shepley, Rutan and Coolidge were additions which included the porch on Copley Square in 1925. The front side towers were another addition. The central tower was designed in part by Stanford White of the firm McKim, Mead and White who also designed the Boston Public Library across Copley Square. 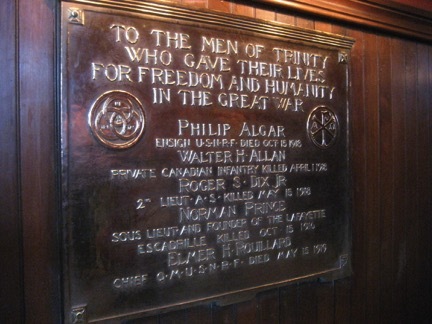 Charles Allerton Coolidge, one of those architects for the porch, awarded the commission of a large bronze war memorial tablet to Frederick Allen for the nave of Trinity Church inside the front doors to the right of the entrance to the sanctuary. Other commissions Allen received from Coolidge were a bas-relief portrait of Mayor Andrew Peters, a tablet for an unspecified large Boulder and a Peabody Medal. The work earned him the attention of the BPL who commissioned him to create a bronze memorial plaque for the courtyard of the Library. 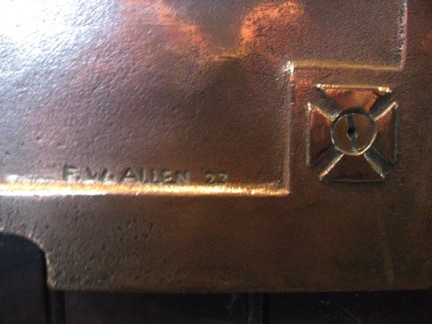 Allen was in good company here at Trinity Church and the Boston Public Library. The interior painted murals and decoration at Trinity were completed by John LaFarge. Sculptural portrayals of the Rector Phillips Brooks were added, on the exterior Boylston Street side by Augustus St.Gaudens (1910) and on the interior by Daniel Chester French (1898). French also sculpted the bronze entrance doors to the BPL. Frederick McMonies “Bacchante” graces the center of the Library courtyard where Allen’s tablet hangs. The Art and Science figures at the entry stairs were created by Allen’s teacher Bela Pratt who had been an assistant to St. Gaudens. These men, Richardson, White, McKim and LaFarge, were the nucleus of an elite group of artists who created an artistic renaissance for America. It was an honor to be chosen to be in their company. The large highly polished tablet was meticulously created by hand, each letter and symbol carved in relief by the sculptor in clay, the whole then cast in bronze. The texture of the original clay is visible throughout. The text memorializes the five members of Trinity Church who died in the war effort with the words, “To the men of Trinity who gave their lives for freedom and humanity in the Great War” followed by a list of the men, their titles and dates of death. The text is surrounded by a rectangular architectural frame with a stepped cornice and footed base. The type style Allen chose is like Copperplate, a traditional serif face in large and small capital letters. The symbols chosen are relevant. The inside corner cuts feature the symbol of a square military cross of valor at the center of which is the bronze screw used to attach the tablet to the wall. Two larger Christian symbols in circular borders introduce the names of the heroes. On the left are the three intertwined rings representing the trinity and on the right, the Chi-Rho christogram. It’s conservative elegance, size, condition and placement on the wall make it outstanding.